Hi guys, hope you’re all well? 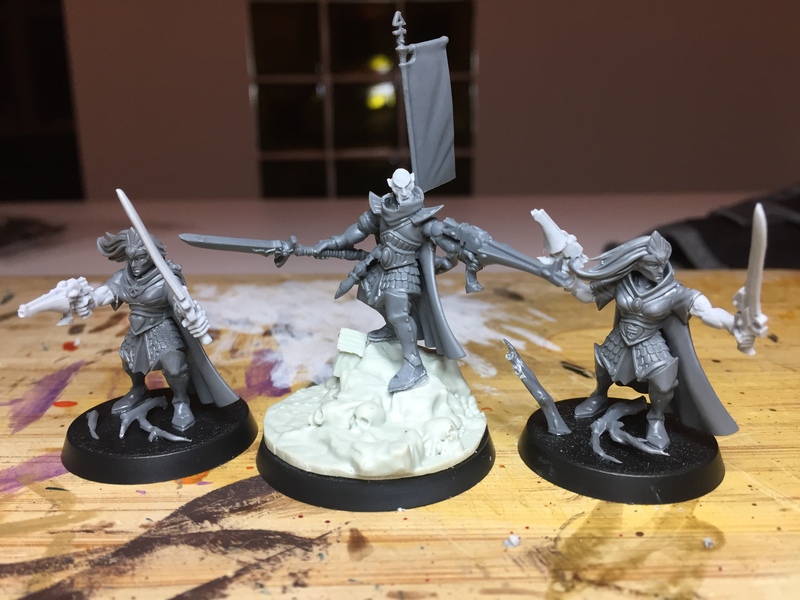 So, I was planning to do some painting over the weekend and finish Ostium Guide number two, but I didn’t feel very painterly… However, I did feel a bit builderly, so I got started on my warband for The Chapel. I thought I’d post the WIPs as they stand and get some feedback from you lovely peoples. Please be critical in your commenting – I want these to be awesome, so all comments and suggestions are welcome! I’ll talk you through the thinking with each as we go, and indicate what else is to be done. 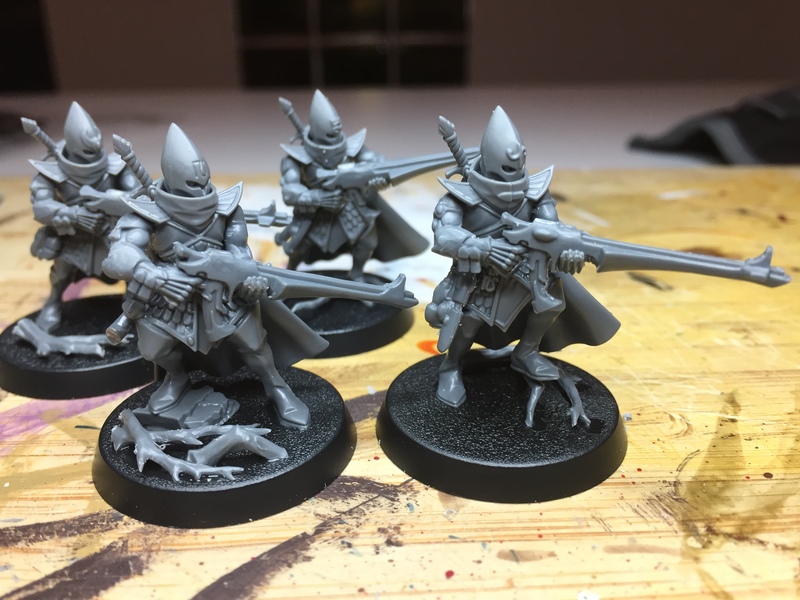 In terms of background, I’m going for an Exodite Eldar warband – The Storm of Winter – mainly to push me out of my comfort zone and give myself a real challenge to paint stuff I wouldn’t normally do. The high-level concept is that The Chapel is psychically linked to my Exodite world via the webway, and that bad juju is leaking through the webway and corrupting the forest home of my Exodite clan. A task force is sent to investigate and save their world, they find stoopid meddling Mon-kieghs, carnage ensues, etc. etc. Here is my first character – a warhost leader (name pending). 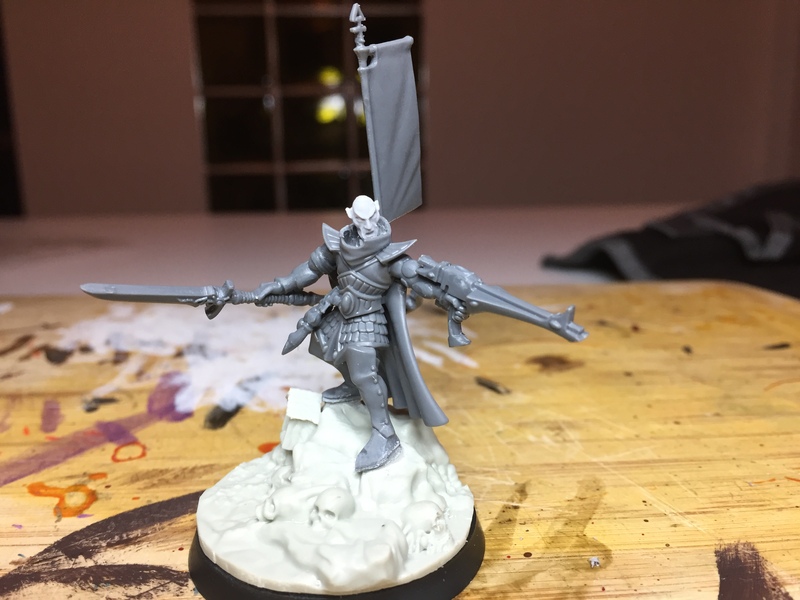 He’s in charge of the martial aspect of my warband (as opposed to the spooky part), and is roughly intended as an Autarch/Exarch level character. Made up of Shadow Warrior and Dire Avenger bits, with a Black Guardian head and posed on a yummy Black Tree base (thanks Mark!). I intend to reposition the left arm slightly and sculpt on some short sleeves and tidy up the neck. 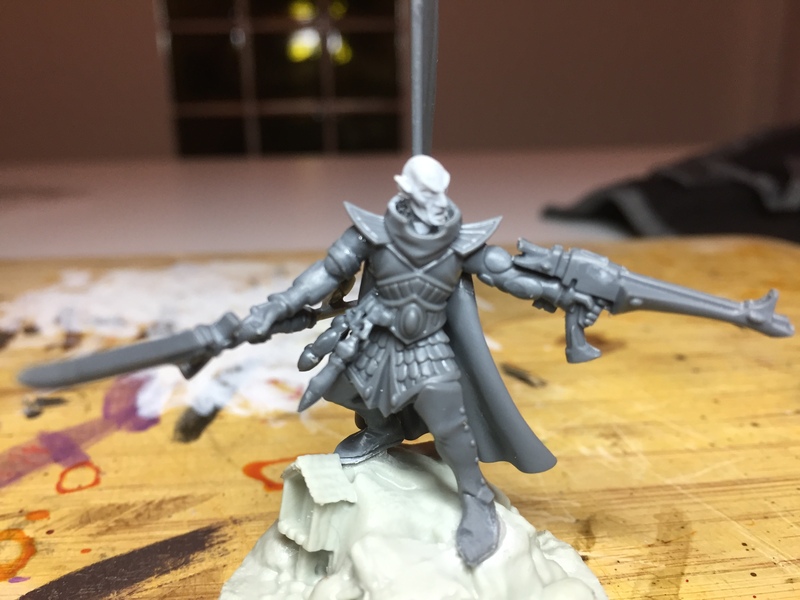 I’m also considering sculpting on a hood or even a chain mail coif (thinking of the Necromonger Lord Marshal in the Chronicles of Riddick here)… thoughts? 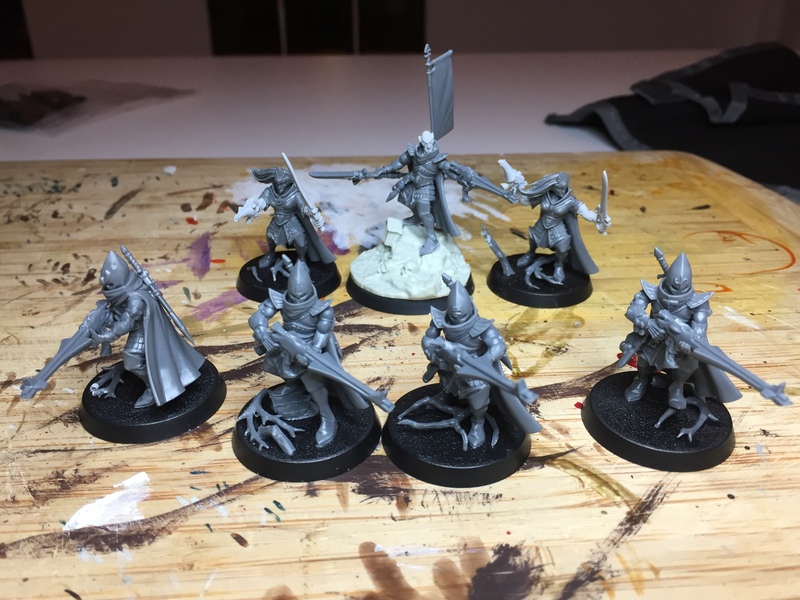 These next guys fill four of the six Henchmen slots – Dire Avenger equivalents (which works well with the warhost leader as Exarch in any future 40k force). Again, made up of Shadow Warrior and Dire Avenger bits. I de-cluttered and simplified the arms to remove anything overly technical looking, so as to look a bit more primitive than a Craftworld Eldar. I intend to sculpt some short sleeves on them, and I’ve just noticed that one Shuriken Catapult escaped having the gems removed, but not much else planned. I am considering removing the detailing from the helmets… thoughts? So that’s where we are so for – again, any thoughts, comments, ideas or suggestions would be much appreciated at this point, just lay it on me – I promise I won’t cry :-) The next part of the build is going to get really weird, and will focus a bit more on the eldritch side of life… and unlife! :-) Thanks mate – same here! Eldar tend to leave me cold, despite being really cool aesthetically… almost too cool, and I think that’s why they don’t grab me. I’m hoping that exploring a more barbaric side of them might move them away from being ‘too cool for school’ and actually add a bit of gritty interest. You nailed it. Too cool is what it is. They’re like flamboyant Emo private school kids haha. I’m sure you’ll make em shine! The not-avengers look boss, I’d remove the signs as well maybe to freehands a couple of stripes or something. Not sure a hood is what the boss needs, he’s pretty singular and probably quite cocky as well so i’d make him stand with a proper mohawk or fancy hair do, bare headed looks dull though. Those guys are really classy anyway, very good ideas here. Thanks JB, you’re right – I may reinstate his topknot and tattoo his face :-) Good call! Those filthy knife ears better stay away, lest they taste the cleansing flame of the emperors faithful! Now, I’m not too familiar with the exodite Eldar lore, but I think you should play up the natural side of them a little more. Fetishes, talismans of protection, furs, bones, blood sigils, trophies, maybe some sort of totem-beast (wraithlord). They’re off to a great start though, and I can’t wait to see an inq28 take on the Eldar! Ooh, I like that idea – savage them up a little! I could sculpt fur on to their cloaks quite easily, bulk it up on to their shoulders, give them a more imposing silhouette. I hadn’t thought of adding fetishes etc. But I do like that idea… I’ll have a rummage in the bits box ;-) Thanks mate! Really digging these, and I’ll join the chorus of “Eldar just don’t do it for me”. The Dire Avenger henchmen look supremely badass, to the point that they eclipse their leader somewhat. I think the boss man needs a little more ‘oomph’ to him. The head is at the moment looking a bit too simple. This pic of the Necromonger you mentioned has something pretty cool going on with his head: https://goo.gl/images/MGjY0c so maybe something like this might work. As has been suggested above, definitely play up the grit. Talismans/trophies hanging from his gun perhaps? Scars, old wounds? Warpaint? I’m not sure about the back banner. The group looks very efficient, like a veteran team, and the back banner is very neat and clean in comparison – something you’d see when the army is in full parade gear or arrayed for massive battle. The back banner also detracts from the models direction somewhat – at the moment the leader has a lot going on with his legs going one way, the upper body another and the back banner just sort of being there. Removing it might draw the eye more to the model’s head area. That’s my two cents, can’t wait to see these finished! Ok, you sold it to me as I want to see the freehand! I think that once you tweak the head of the leader and make the banner a bit more…rough, it should work a treat. -Sleeves (either baggy tunic/t-shirt type sleeves or renaissance style puff and slash sleeves if you’re up to it) on all models would be good. -The exarch needs hair in my view – either something old school elder like a mowhawk or just shoulder length emo hair. -I would probably add furs to the tops of capes to some of them, particularly if you are going for a wood elf type look when you paint them with greens, browns, tattoos, and warpaint, etc (which would be cool), a few feral elements like fur, maybe feathers, would look good. -I would remove the helmet detail and paint on any runes if desired. -the banshees are the weakest models, but I think they’d look good with paint on them. I don’t like those heads in general (I also don’t really have an alternative to suggest either though) but otherwise I really do think they’d look alright in the rest of the group when they’re all painted. I concur, they need some kind of earthy look, organic as only Eldar can become. Soft curves and nature-like colours (floral trimmings or that kind of stuff). The boss is ace. He just needs a glorious mane waving in the air. He may also benefit from sleeves if you are sculpting them for the other people. The henchmen are awesome to me. Right, the sigils on the forehead can be replaced, but apart from tiny details, they work perfectly, IMHO. On the other hand, I think the ladies could look more… badass. They are to be observed at the same time as the boss, so the bodyguards will draw some attention. Their hair suggest a more dynamic pose, and I think you could dig a little in that direction. Not sure of the possibilities of the models, but I’m sure you can sort it out! Anyway, I love the concept and whatever you do for sure will be cracking!! Love them, and I am actually (very slowly) working on a somewhat similar INQ28 warband myself. Group: yes to fur and bones and whatnot. Maybe raise the bases of some of the other models so that the boss is not so much higher. You could do a set of bases with that look like the 40k classic “pipes under a broken metal deck plate” but with earth and roots, which would look cool and fit both the setting and the figures. Leader: Yes to Mohawk, and yes to banner, but I think you need to reorient it slightly. i would drop the spear thingy and go sword instead. Dire Avengers: I think you should file off the raised insignia, and keep the sunken one. I always think that a INQ28 type group needs a special and a heavy, (sort of like necromunda) so you might consider a warlock analog (beast master? using that new Grynix, and/or the woodelf owl? ), and someone with a bigger gun. Maybe you have that covered in the forthcoming “spooky” element. Anyway, exciting stuff, and I hope to finish something from my own project before you are done with yours so as to not seem like I copied you. Heavies are definitely coming in the spooky half of the team! Filthy xenos, disturbing the glorious rest of the Imperial dead! Back to your forest hovels I say! Seriously, excellent concept mate, and really liking what you’ve done so far. Personally I love the Eldar but I’ve also often found that the races we don’t like so much are the ones that push us towards our best work. Shadow Avengers: Absolutely love ’em mate. Won’t hear a bad word said about them! Very much the standard about which the rest of the warband should be set. 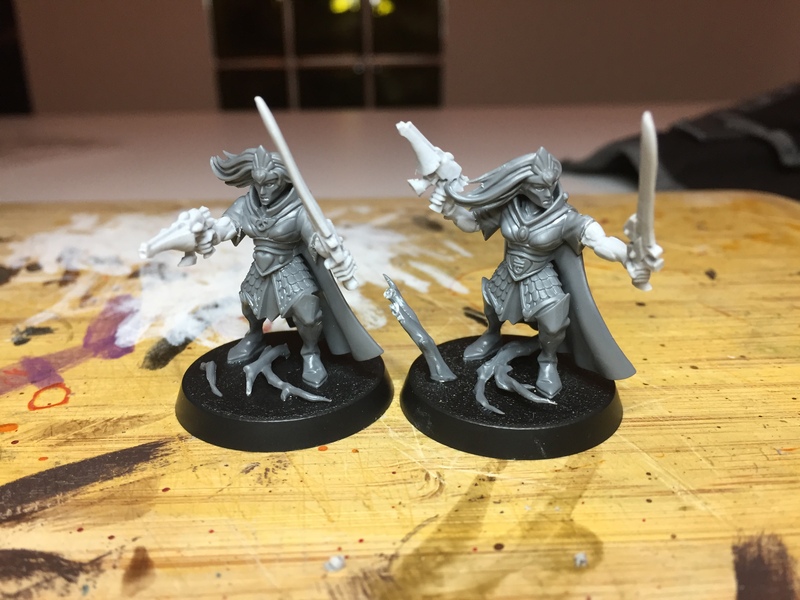 Sisters of Averlorn; trouble is I really dislike the base kit and it’s hard to get past that. You’ve done a good job with them mind, especially considering the quality (or lack thereof) of the base kit. Different heads might help a lot, liked the suggestion of using masked Dark Eldar heads, or how about using creepy harlequin masks topped with crowns of dryad branches? I quite like this assemble on the whole (but I am a dirty xenos sympathiser).I think the leader does need something though – how about one of the witch elf sisters of slaughter masks, but inside a cloaked cowl – something to stand out more from the others. How about a Harlequin mask perhaps? Ah ha! The pesky Eldar are going to be sticking thier pointy noses into things hey?! Excellent! I was hoping someone would play the Eldar. So far they are looking pretty cool and I’m inclined to agree with Remnante that they should be feral looking as if their journey has been long and they have spent many years surviving as a wondering band charged with a mission of great importance. Looking forward to seeing more of these alien scum! :-) Cheers Mark, I was hoping they might bring a certain frisson to the party! The Dire Avengers really look the part to me. The Banshees on the other hand… they look a bit too far on the “Fantasy figures with a gun” that the others manage to avoid. I think perhaps hanging some more Eldar widgets from them, or even headswaps for something else? Something from the Dark Eldar range perhaps? A couple of carefully chosen Harlequin heads? I’m sure paint will draw them all together well though, but yeah, that’s my critical look at the WIP builds. Hopefully it’s useful in some way to you.